Installing new in-wall wiring for your home theater system? Installing new in-wall wiring for your home theater system? This handy wall plate provides connections for up to seven speakers and two powered subwoofers. This plate lets you hide your receiver in an adjacent room or gear closet and run speaker cables into your home theater — a great option for folks who want a clean, professional-looking installation. Or, install one of these outlets directly behind your receiver and run your speaker and subwoofer cables inside your walls to each speaker location. Nice and clean look. I was also able to use the free labels provided by Crutchfield to quickly and easily identify each of the wiring connections on the face plate (I was already pre-wired). 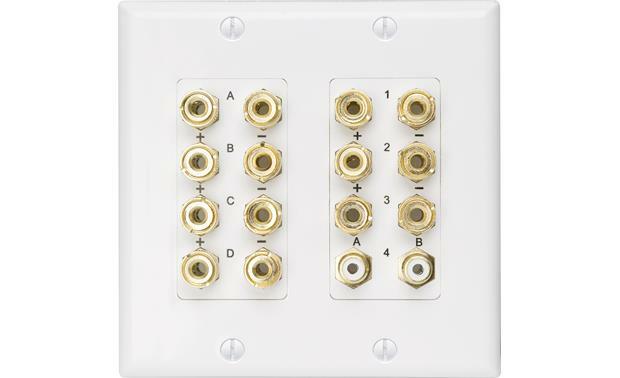 7.2Ch Home Theater Wall Plate: Russound's Home Theater Plate (HTP-7.2) is a Decora style double-gang in-wall connection plate designed to allow easy hookup of all the speakers in a 5.1ch or 5.2ch, 6.1ch or 6.2ch, or even up to a 7.1ch or 7.2ch surround sound system. It includes terminals for up to seven speakers and two powered subwoofers. Independent Design: The Russound's Home Theater Plate (HTP-7.2) consists of two independent single-gain connector plates and one double-gain decora plate. 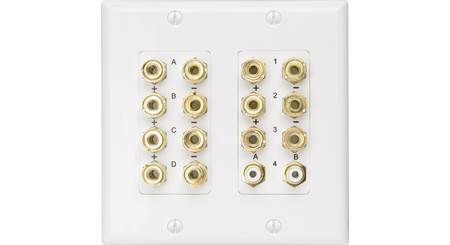 Both connectors plates can be installed in a 2-gang box (sold separately) using the included decora wall plate. Or you can separate the two connectors plates into two single-gang installations (single-gang decora wall plates and boxes sold separately). A-B-C-D Connector Plate: Includes four pair of binding post speaker terminals (labeled A, B, C, D). 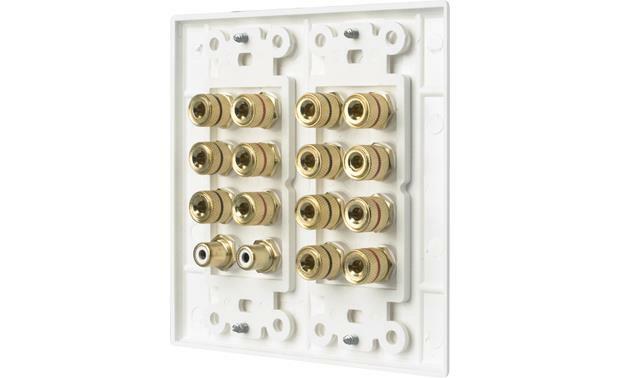 1-2-3-4 Connector Plate: Includes three pair of binding post speaker terminals (labeled 1, 2, 3) and two RCA jacks (labeled 4). Binding Post Speaker Terminals: There are seven pair of gold-plated, 5-way binding posts that can accept 16-12AWG speaker wire, spade-lugs, pin-connectors, as well as single or dual banana plugs. The binding post terminals are double-sided for easy connection. They are also color-coded (Red = Positive, Black + Negative) for easy identification. The binding posts have 7/16" hex nuts for easy and secure connections. The posts have lock nuts to prevent them from turning as you tighten the binding posts onto the wire. Note: The spacing between the binding posts is narrow, so we don't recommend pin-connectors and spade-lugs. Dual RCA Connectors: Two gold-plated RCA jacks provide connection for two powered subwoofers. The RCA jacks are double sided for easy connection and use female RCA connectors. Designed for powered subwoofer connection, these connectors can be used with any RCA compatible connection. 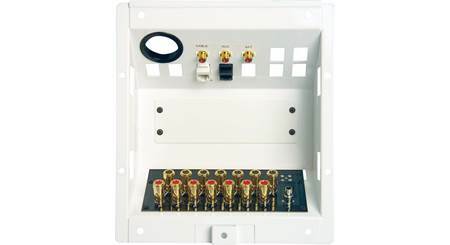 Searches related to the Russound HTP-7.2 Home Theater Wall Plate In-wall 7.2-channel home theater connection plate.